‘Jeeto Pakistan’ is Pakistan’s most popular game show which is hosted by Fahad Mustafa and aired every Friday at 7:30 pm and every Sunday at 8:00 pm only on ARY Digital. This game show has won the hearts of all its viewers in Pakistan and across borders as well and people are deliberately waiting to get passes to attend this show. Here are the clippings from all the 100 episodes where Fahad is continuously entertaining his audiences and distributing unlimited prizes. For the 100th episode Uzair Jaswal from the cast of ‘Jalaibee and the director Yasir Jaswal were called to the show as guests. Yasir Jawal tweeted about it saying that they had lots of fun at the show. @fahadmustafa26 #JeetoPakistan heading to Dubai next month??????? ?Very soon #JeetoPak will be called as the world’s no.1 game show in Shaa Allah???????? @fahadmustafa26 Congratulations on the 100th Episode of #JeetoPakistan? ?Im really Proud to be a Viewer of it!??? ?It’s all because of YOU???? Jerjees Seja (JJ) CEO of ARY Digital Network had tweeted a picture of the team on this proud moment and also announced that ‘Jeeto Pakistan’ will be going to Dubai in April 2015. Fahad Mustafa in his entire journey has called actors and celebrities to the show to add the extra glamour to the whole package where the viewers would also enjoy it. Stay in touch for more news about ‘Jeeto Pakistan’ and keep watching it to make it the world’s Biggest Game Show. If you have missed any of the episodes watch them here and you can also register here to attend the show. 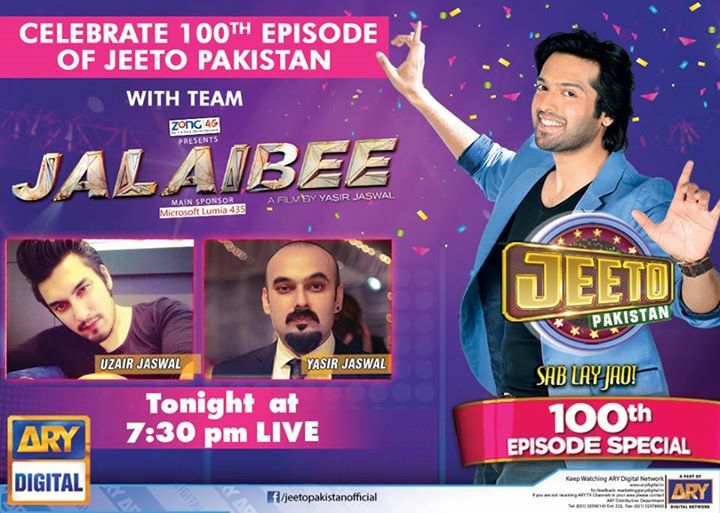 You can also visit the following link to watch the 100th Episode of ‘Jeeto Pakistan’! Don’t miss out on watch the biggest game show on the weekends to add on the fun and watching your favorite Fahad Mustafa entertaining you with his glamorous guests.